The 3111/14 Electronic Article Surveillance (EAS) label applicator showcases the latest in security tag labeling with Label-Aire's renowned New Generation Technology. Available in either Checkpoint (3111 Air-Blow) or Sensormatic (3114 Tamp-Blow) configurations, our EAS applicator aids in theft prevention of goods ultimately reducing costs for retailers. The 3111/14 EAS label applicator is equipped with an advanced stepper motor drive for precise starting/stopping, increased reliability, and lower maintenance. 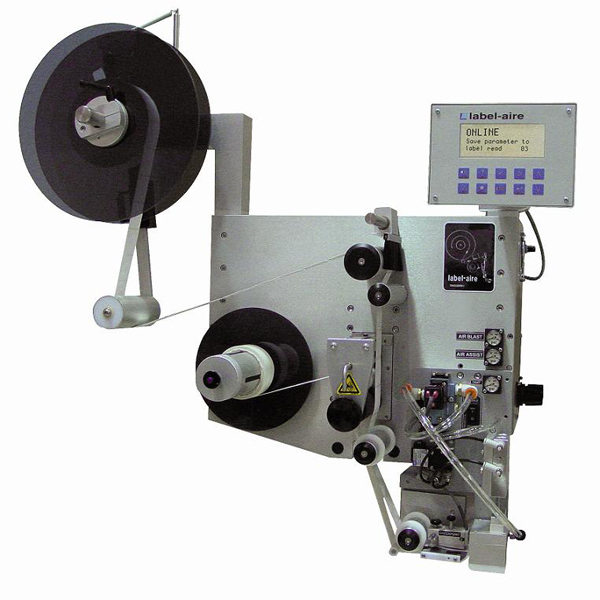 Advanced features include Velocity Compensation for improved label placement accuracy. Speeds up to 1,500 inches (3,810 cm) of web per minute and Zero Downtime labeling allow your production to continue without costly interruptions. Label queuing and missing label compensation virtually eliminate unlabeled products. Options include a variety of drop down and extended snorkels to reach into tight spaces, a 20" (508 mm) non-powered unwind, as well as a Checkpoint or Sensormatic EAS change-over kit for added versatility.